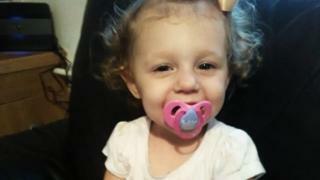 A man charged with killing a 22-month-old girl has told a court he does not know how she came to be injured. Thomas Curd, 31, denies murdering Eve Leatherland in October 2017. Her mother Abigail Leatherland, 26, also denies the charge. Eve died in Liskeard, Cornwall. Her injuries included a fractured skull and ruptured liver and she was found with a fatal amount of codeine in her system. Mr Curd has been giving evidence at Truro Crown Court. The court heard how he had been in the house with Eve and Ms Leatherland for several days prior to the little girl's death on 5 October. Mr Curd, from Watford in Hertfordshire, started a relationship with Ms Leatherland, in the summer of 2017 having been introduced on Facebook. He told the court he had a good relationship with Eve and would "play with her and her little dolls and ponies". When asked if he ever lost his temper with her, or caused her injuries, he replied "No, I never. I never did nothing to that child", adding that he had the "tiniest" temper. There was codeine in the house belonging to Mr Curd, but he denied giving any to Eve as a way of masking her injuries. When asked in cross examination why he had not phoned a doctor sooner, he said: "I know I should have done something, I just didn't. I don't know why." In the days leading up to the death, the court heard he sent a number of photos to Ms Leatherland showing that Eve was unwell. He told the court: "I wanted to show she was very unwell, very pale, being sick, drowsy and not being her normal self". Both defendants have denied an alternative charge of manslaughter by gross negligence.